Is this Sallie Keyes Creek trail real? 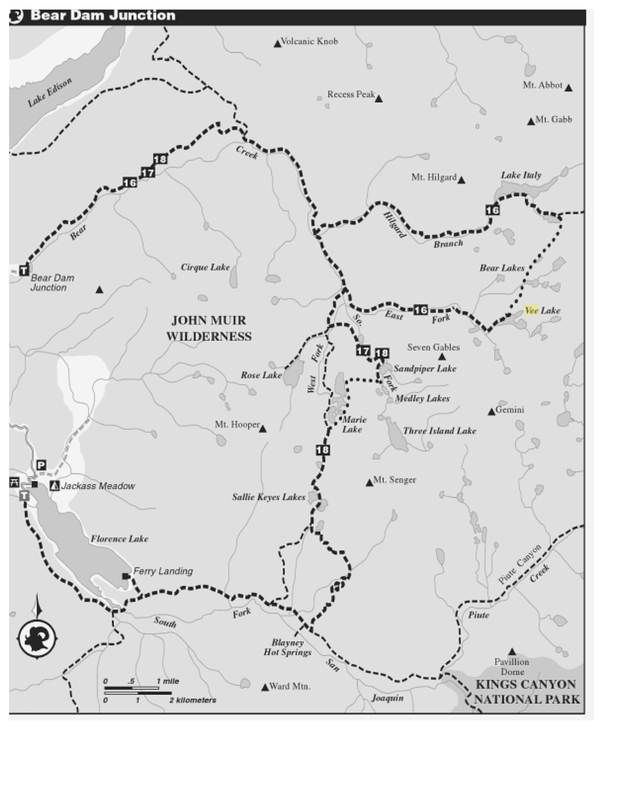 There is this map illustration in the newer (2006) edition of "Sierra South" (Kathy Morey/Mike White) that is not in my older copy (1993), and it shows a trail branching north from the "Florence Lake to the Muir Trail Ranch trail" (that stretch could be called the "South Fork Trail"? it catches up with the JMT/PCT east of the MTR). Anyway, this new trail heads north from the east/west trail and joins the JMT/PCT a bit below Sallie Keyes Lakes, but it stays entirely west of Sallie Keyes Creek. Re: Is this Sallie Keyes Creek trail real? That's the cutoff trail. It's there. We were heading up it on a SAR last year. I hiked it this year. Steep, spots with thick brush and lots of downed trees on the upper reach before Sallie Keyes, only mildly maintained by Lost Valley Pack Station and MTR. In a effort to "update" their book they put in a whole lot of alternate routes with their latest edition. They make this point in the forward of the book. Better to have it and not need it than it is to need it and not have it! And thanks, Bill, and that's a good thing. We're fans of alternate routes! I think my partner on the trail has the newer edition (I was only seeing it in Google Book's scans), and if she does we'll be checking it out for even more new hints. While I have not been on it, I thought I would add that the trail is an old route that predates the JMT. The one time I was looking for it we were coming from Selden Pass, but we missed it and ended up using the JMTR cutoff on the east side of Senger Creek. Not sure if this link will work or not, but check out the old Mt Goddard topo (1912, reprinted in 1933) they have in the Cal Berkley Earth Sciences and map library. 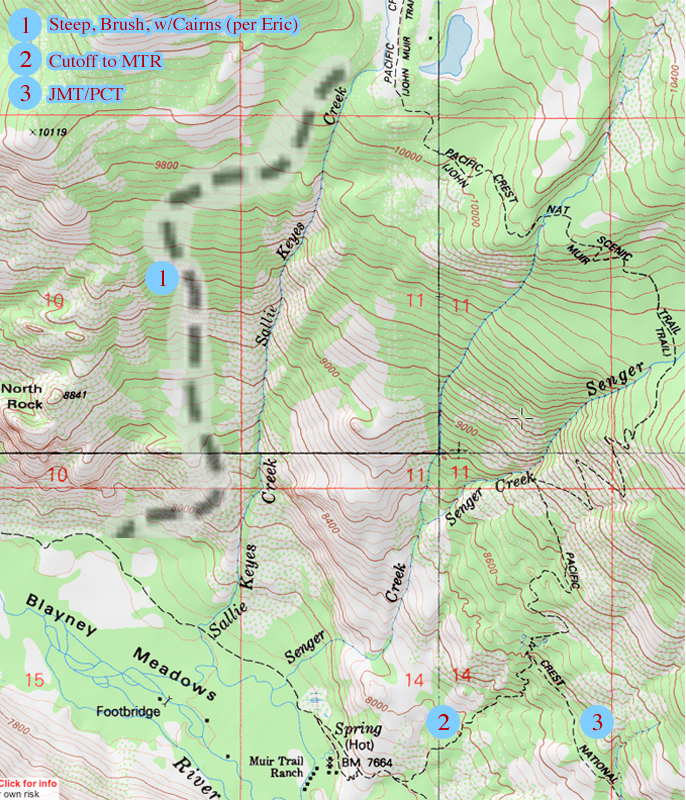 The JMT didnt exist yet, but the trail you mention is the one route shown over Selden Pass. Theres also an old trail shown heading northeast and UP (empahsis on up) over the ridge that extends south of Turret Peak. Ive seen remants of that trail as it crosses that ridge, but never knew what it was until I saw these maps on this site. Switchbacks of loose granite and Manzanita mazes begin near the top and on the east face of North Rock. The top half of the route you drew looks fairly accurate. Bottom half, appears to need a little work. Yeah, I wondered for the vintage map (that is cool Berkeley has that stuff all archived) if back then the word was just "a trail just west of Sallie Keyes Creek" and what was drawn on the map only reflected that, but the route feet actually hiked on back then was more like today's "trail". For my topo overlay I did just copy the trail from the "Sierra South" book and resize it and place it, and yeah, I probably needed to scale it a little bigger so the top and bottom both made some sort of sense with the topo... As per the topo from the bottom it must go up to the less steep lines just left of the "Keyes" of the lowest printing of the creek name.